Glutathione is an essential antioxidant in the cells that prevents damage of biomolecules due to oxidation. Glutathione is also a popular ingredient in pharmaceutical products. The MicroMolar Glutathione Assay Kit is for measurement of micromolar concentrations of glutathione. 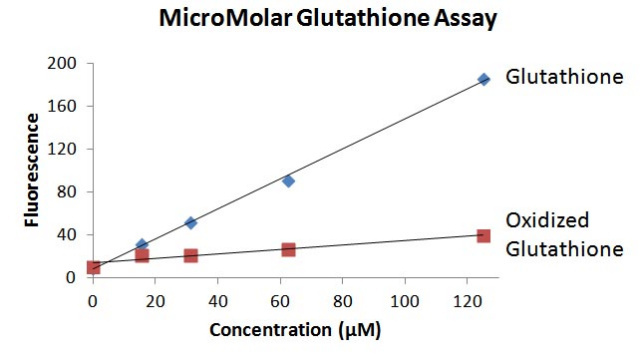 The assay is based on increase of the fluorescence intensity (emission 535 nm, excitation 485 nm) of the kit fluorescence dye MAA upon binding to glutathione. The assay detects reduced glutathione (GSH) at a much higher sensitivity than the oxidized form (GSSG). The assay kit can be used for measurements glutathione concentrations in pharmaceutical products, biochemical reactions or other samples. The assay is compatible with HEPES buffer, low concentrations of non-ionic detergent (<0.01%), MgCl2 (< 5 mM), CaCl2(<5 mM), EDTA (< 1 mM) and phosphate (< 1 mM). It is not compatible with thiol compounds such as DTT and cysteine. It is not compatible with samples with histidine. The MicroMolar Glutathione Assay Kit (catalog number MGA200) includes 500 µl of 10 x MAA dye. It is for 200 assays using 96-well plates.